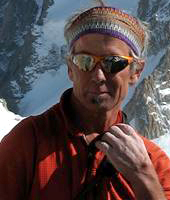 Doug is an IFMGA certified guide and has been climbing for 40 years and skiing for 30. He began his career as a professional mountain guide in 1978 and is a past Chief Guide for the Yosemite Mountaineering School. Doug has guided a multitude of routes in Yosemite Valley ranging from numerous ascents of Half Dome and El Capitan, free climbs of Astroman and the Rostrum, to tiny routes at Swan Slab. Tuolumne Meadows continues to be a favorite climbing venue with some of the best slab routes anywhere. Doug is an active ice climber, seeking the best ice in Canada, WY, CO, and CA. In January 2007 Doug and two guide friends climbed the famed Widows Tears in Yosemite Valley, one of the biggest ice routes in North America. He has climbed throughout the US, Canada, Europe, Alaska, Mexico, and Ecuador. Doug is an avalanche instructor and teaches guide-training courses for the American Mountain Guides Association. Check out photos from recent trips on our blog!